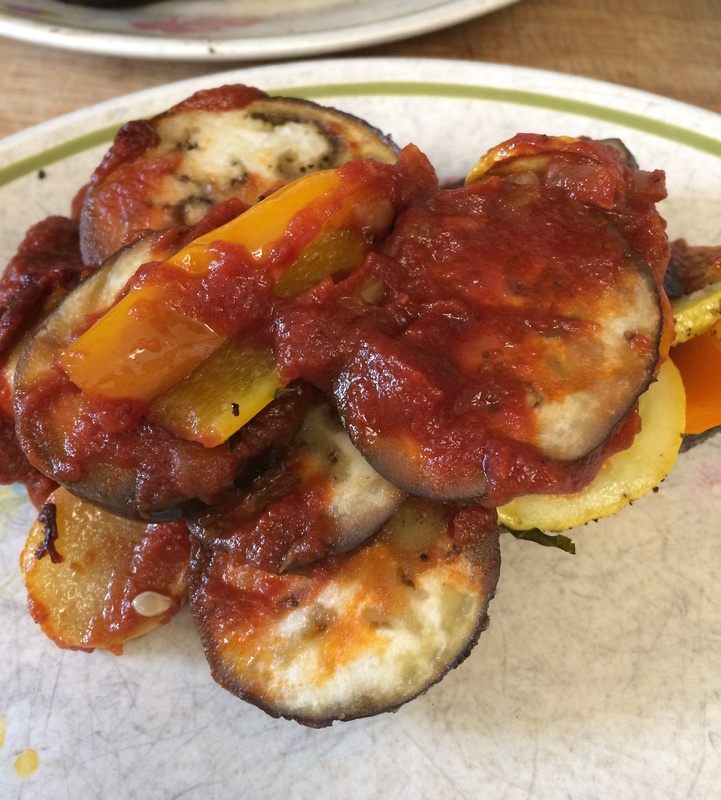 This is a recipe idea that developed over the course of the afternoon. It’s based upon a Moroccan Lemon Chicken recipe that I really like, but I wanted to use other ingredients I had on hand. Over the past couple years I have purchased multi-packs of lean pork roasts from Costco. 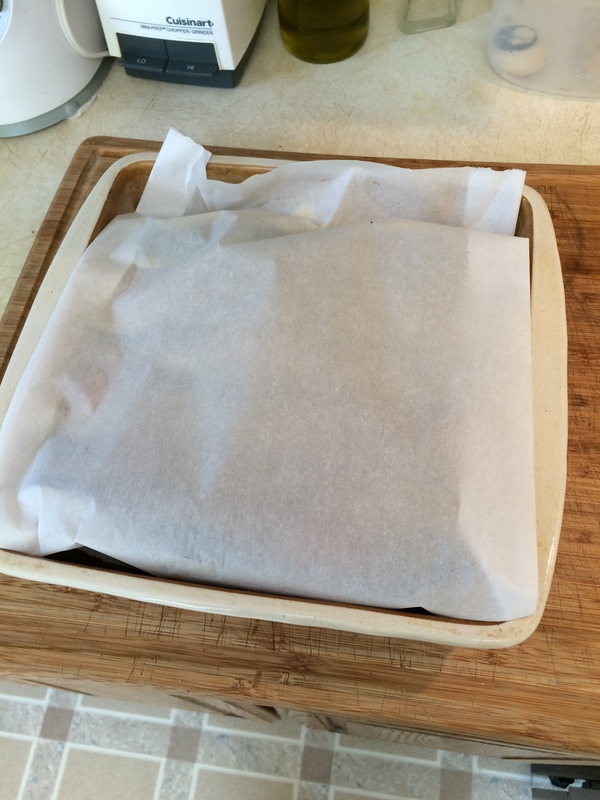 Most people probably make pulled pork with them, but they’re easy to cube for stews as well. 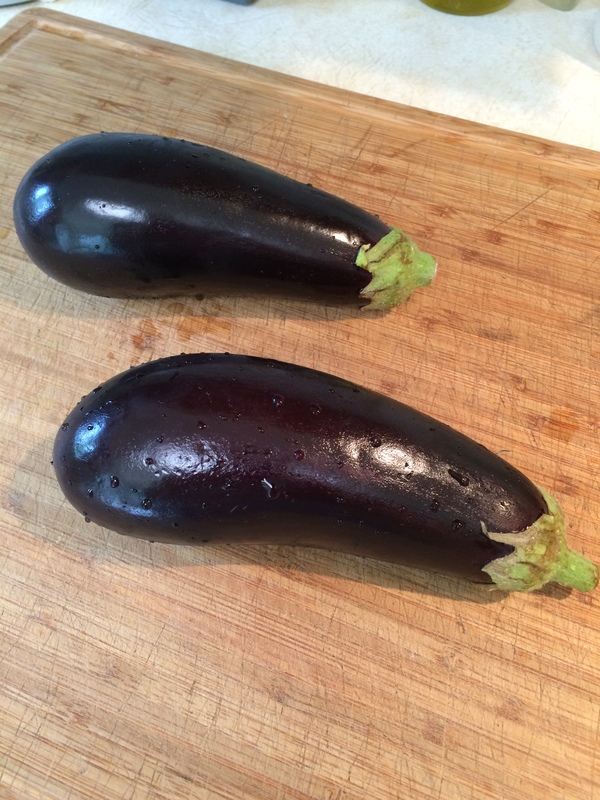 I also had the last of those zucchinis from the on-sale dinner the other day. Plus, I bought a bag of lemons which are not lasting as long as I had hoped. Since I’m still playing around with the mechanics of posting, I’ve placed the recipe first and the photo instructions second. It’s hard to know whether most people favor reading or a visual representation. 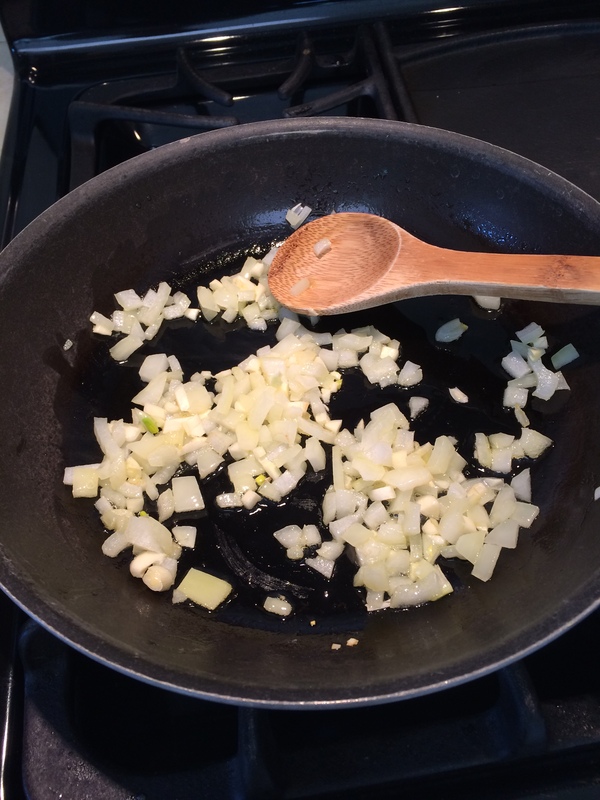 In large pot, fry onions and garlic in 1 Tbsp. olive oil over medium low heat until softened. Stir in turmeric and fry for another 2 minutes. [The aroma at this point is sublime.] Add paprika, cumin, coriander, and cardamom and continue frying over low heat for 2 minutes more. Transfer the mixture to a bowl and set aside. Heat 2 Tbsp. olive oil in the pot and brown the pork pieces. 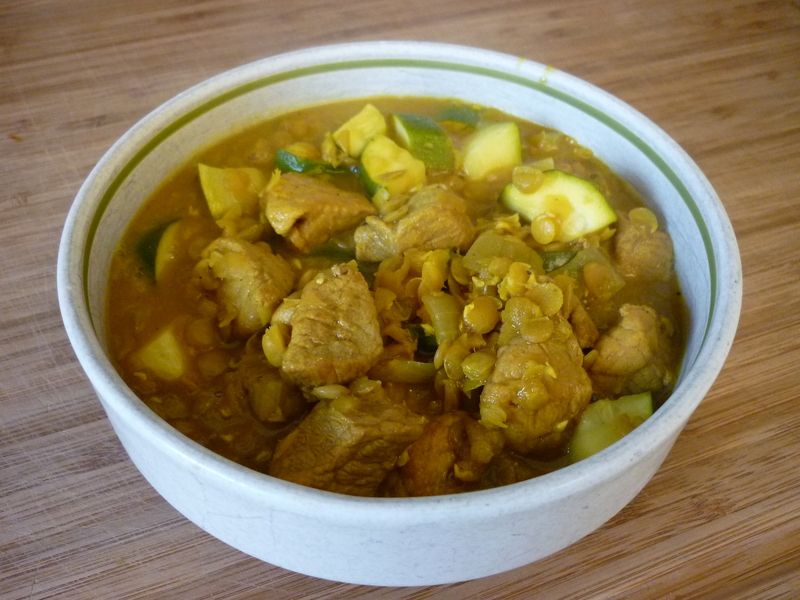 The remnants of the turmeric should turn the pork a golden color. If not, add a pinch more of turmeric. Return the onion mixture to the pot and pour in the chicken broth. Juice one of the lemons and add the juice. Cut the other lemon into quarters and add them. Stir in the lentils. Cover and let simmer for 35-60 minutes, depending upon how old your lentils are and how mushy you like them. 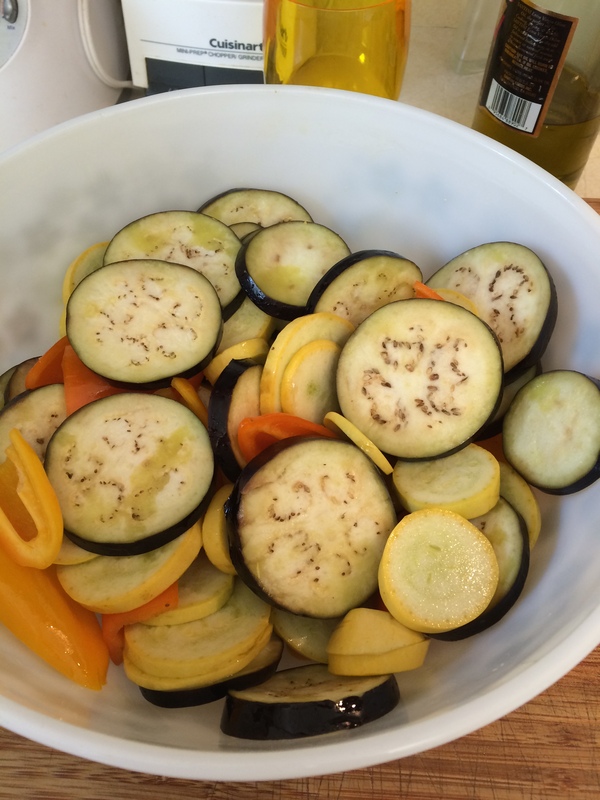 Add zucchini and simmer until they’re cooked. Season with salt and pepper. 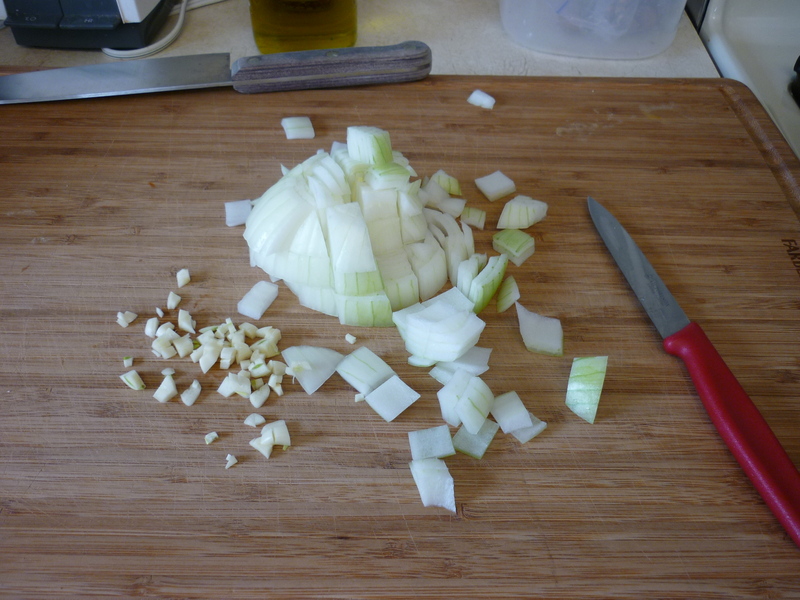 Chop onions and garlic. Saute in olive oil until soft. Add spices and saute. Your kitchen will smell SO good! 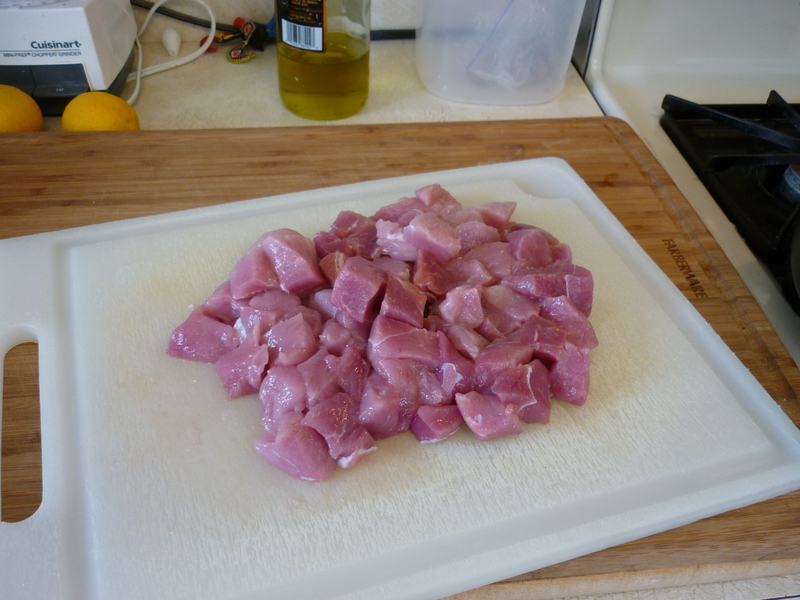 Cut pork roast into 1" pieces. 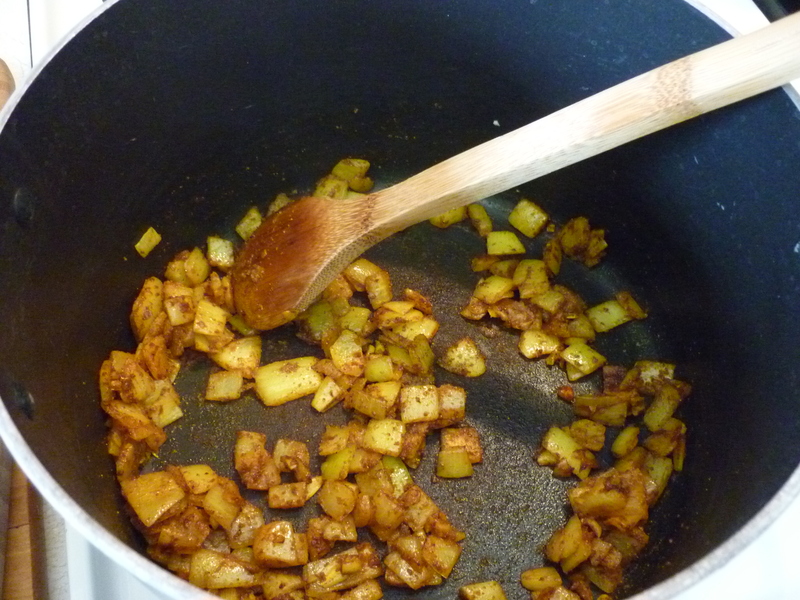 Remove onion-garlic-spice mix from pan and set aside. 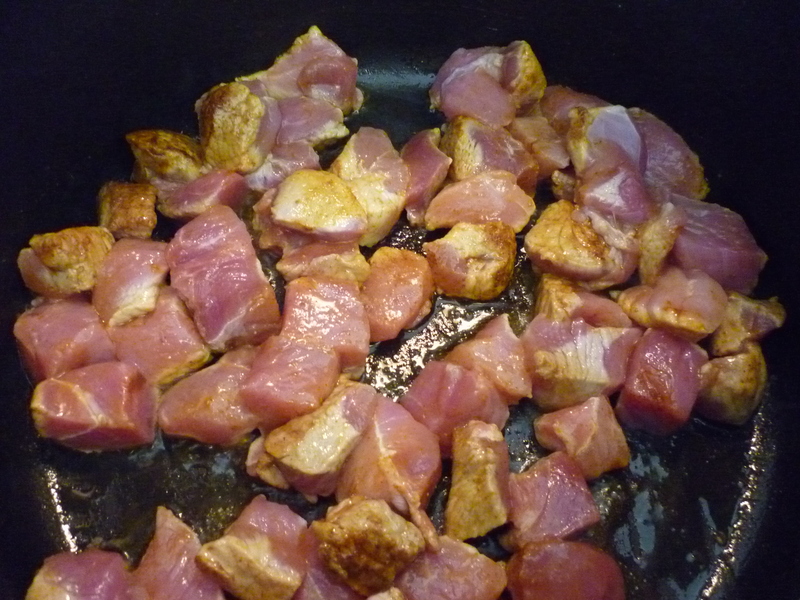 Add olive oil to pan and saute pork pieces until browned. 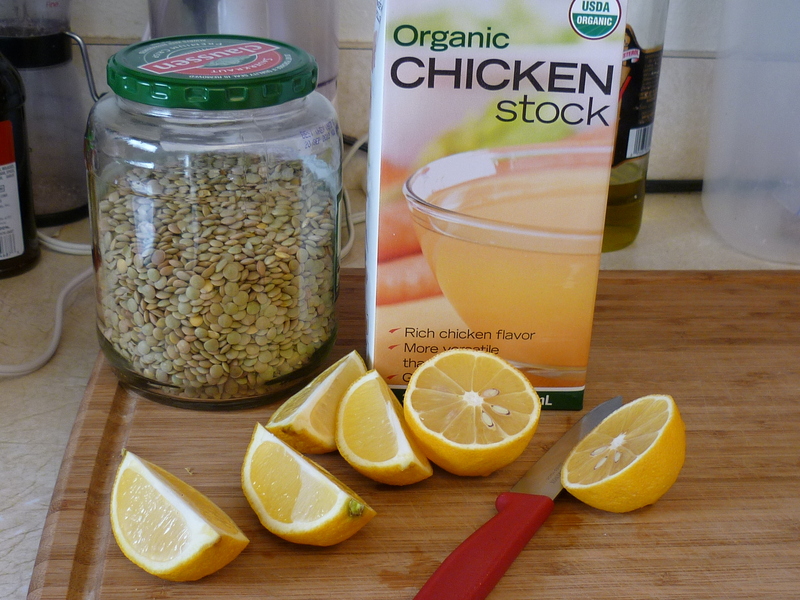 Add chicken broth, lemon juice, lemon, and lentils. Simmer until lentils are cooked. 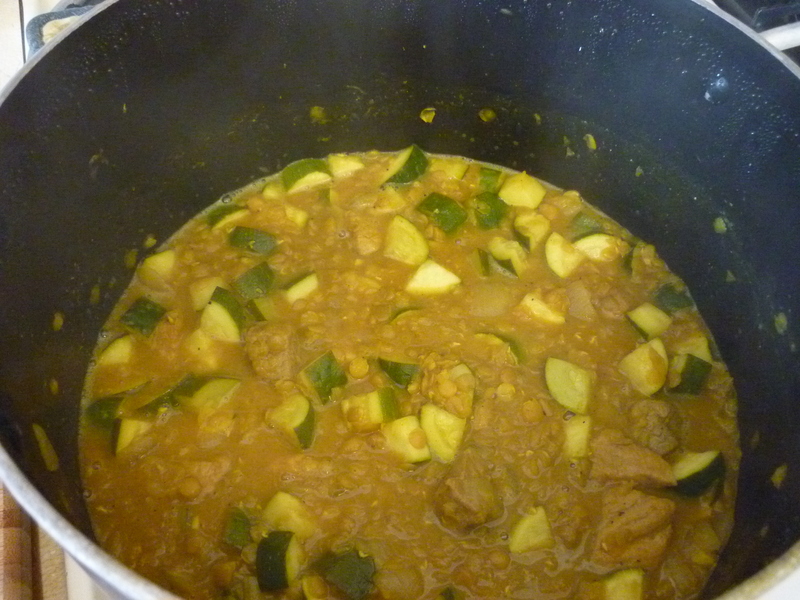 Add zucchini and simmer until zucchini is cooked. And serve like stew, pictured here, or over rice. I ran into a neighbor at the grocery store last week and she told me to go check out the sale produce in the back of the store next to the seafood. Amazing. That day I came home with about 10 bell pepper of various colors for $2.99. That’s what the regular price is for each one. I got the whole bag! Two days ago I picked up a bag of russet potatoes (I’d guess 10 pounds) for $1.99 and a bag of mixed bell peppers and zucchini for $2.99. We are in produce heaven. 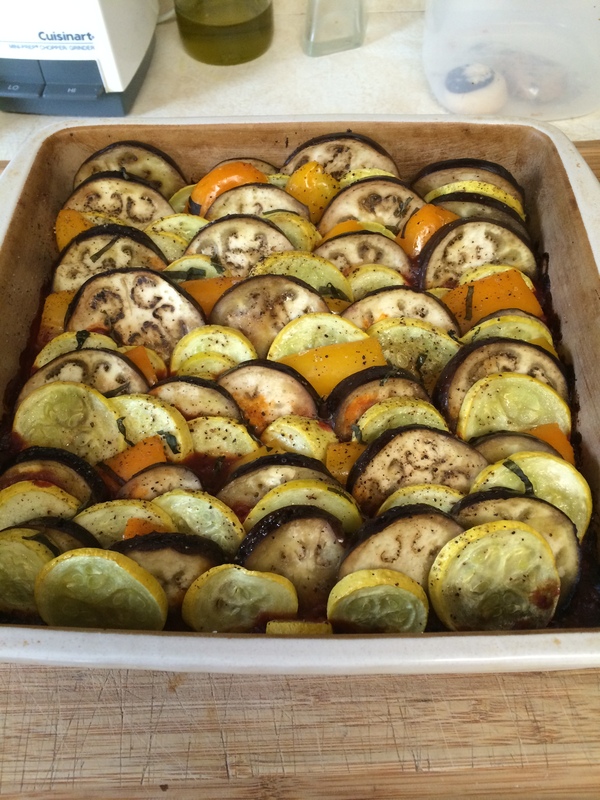 Tonight I made a zucchini dish of my own invention. 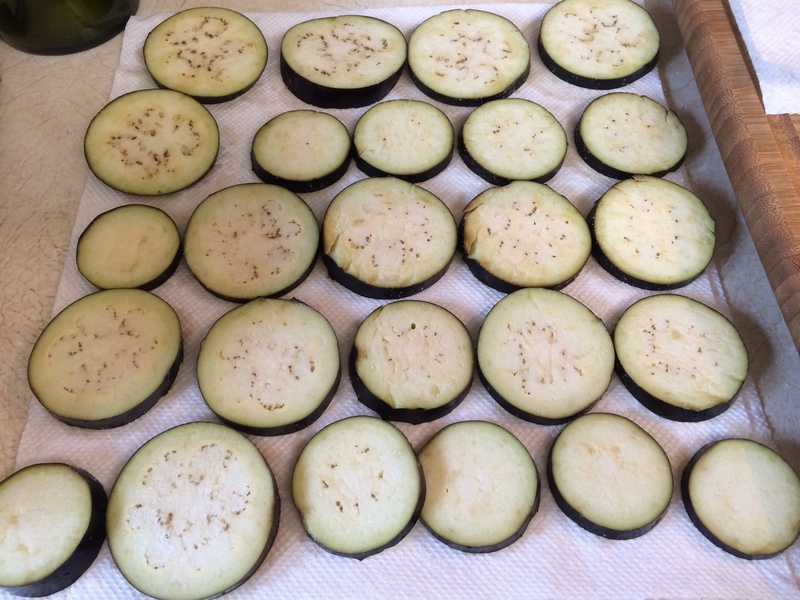 After you scoop out a lot of the flesh, lay the zucchinis in a greased 11×7″ baking dish and place pieces of mozzarella on top. 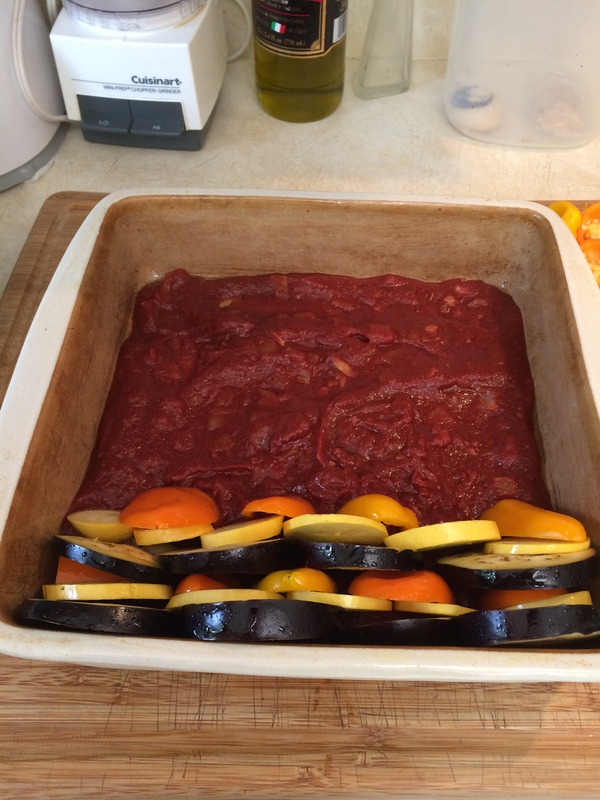 Bake, uncovered, for 45-60 minutes. You may need to place a foil tent over the top at about 45 minutes if it gets too brown. YUMMY! Fry the Italian sausage in a medium pan until no longer pink. 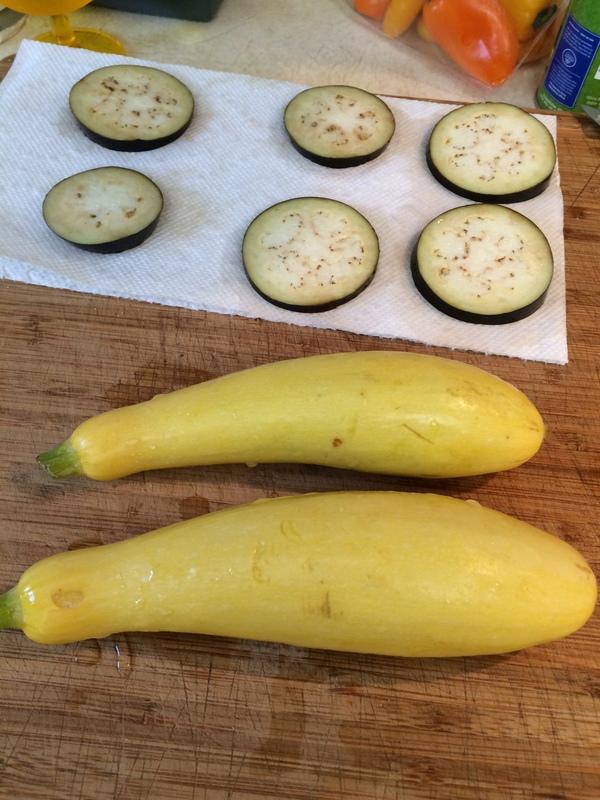 While it is cooking, cut the ends off zucchini and scoop out the soft seed part. 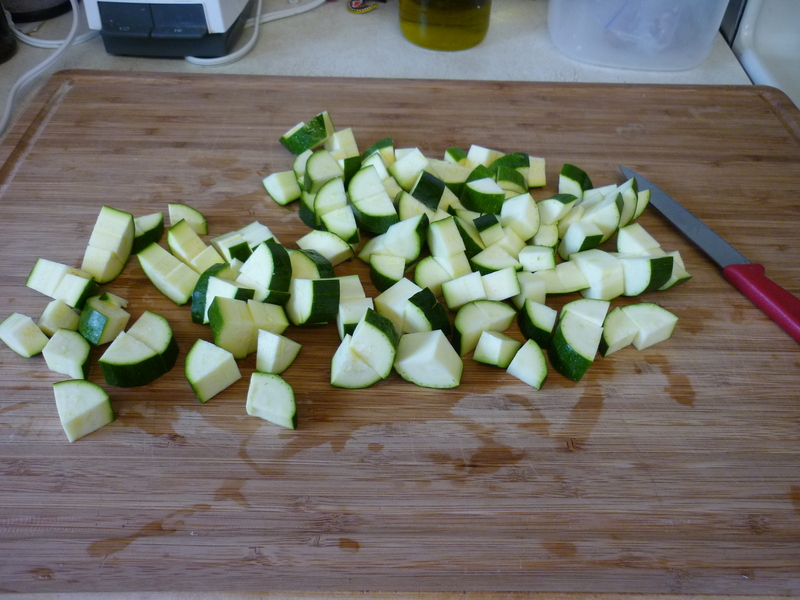 Zucchini becomes quite watery while cooking and you want to remove a lot of the interior flesh. Chop the scooped out parts and add to the cooked sausage. Saute a little longer. 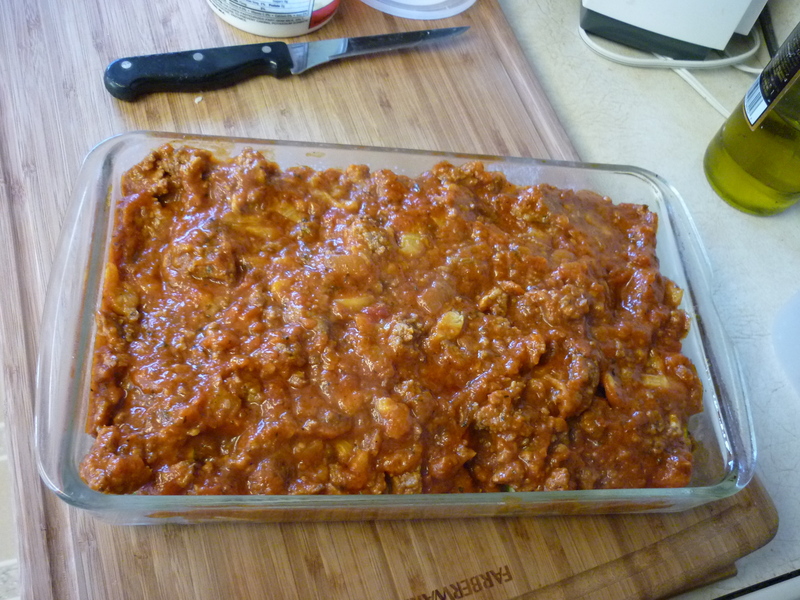 Add pasta sauce to the Italian sausage mixture and let simmer for an hour, uncovered. 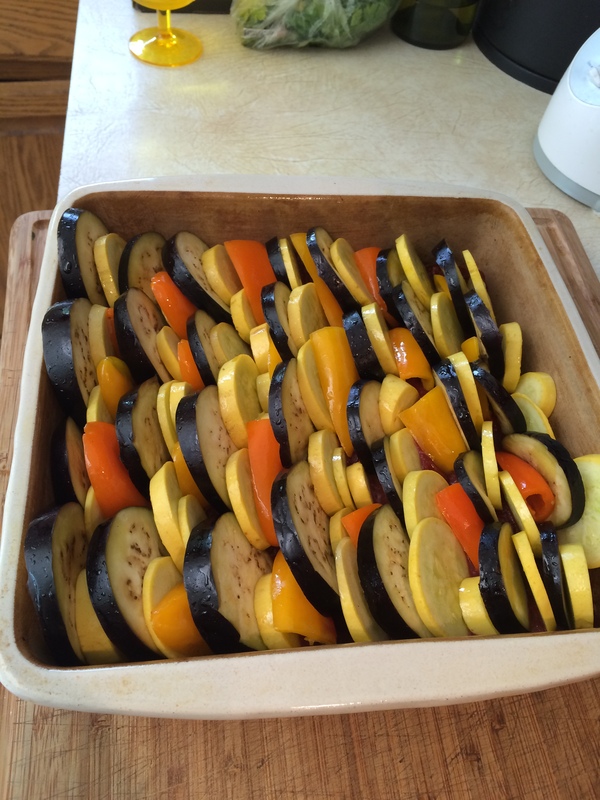 To assemble the dish, lay out the zucchini shells in a greased 11×7″ pan. 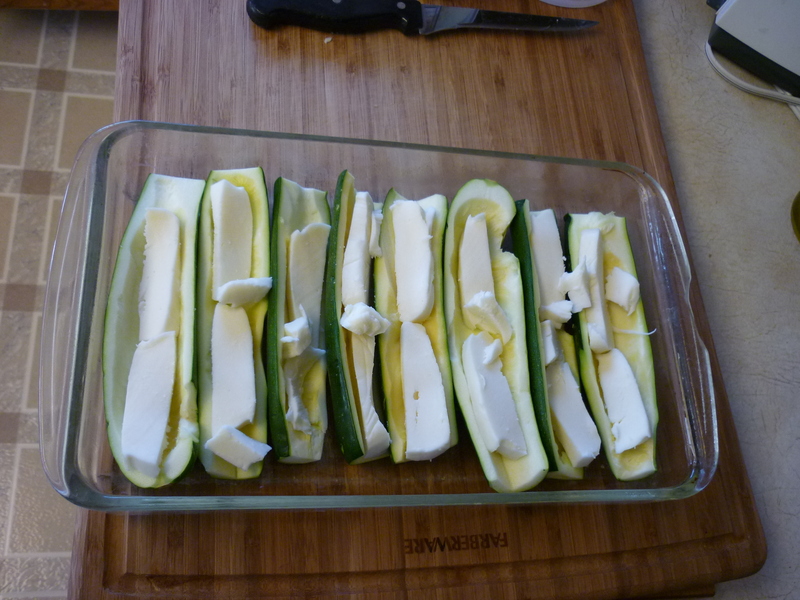 Cut the mozzarella into pieces and lay the pieces into the zucchini shells. Cover everything with sauce. 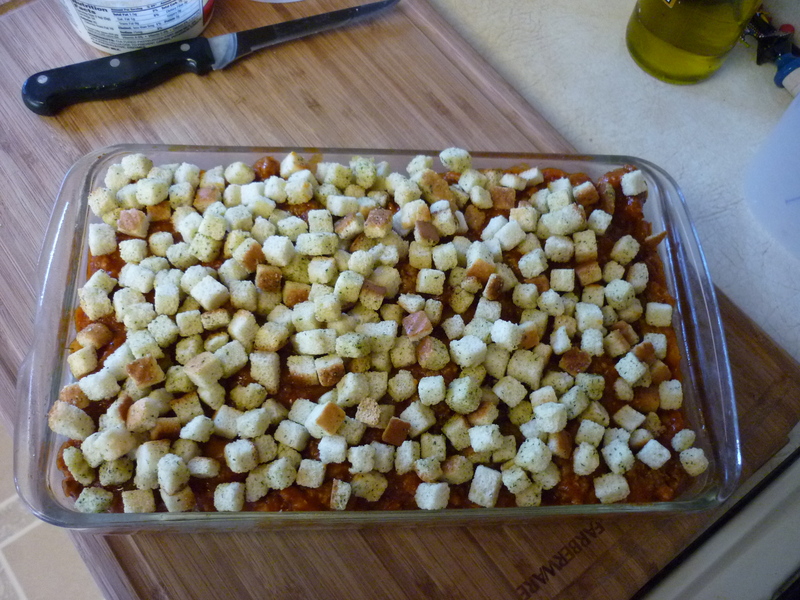 Sprinkle croutons across the top. 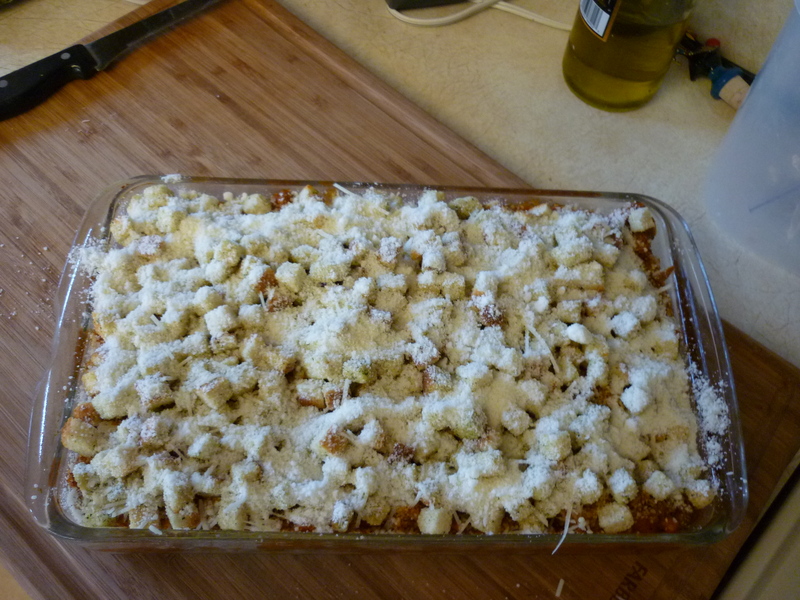 Sprinkle Parmesan cheese over all. 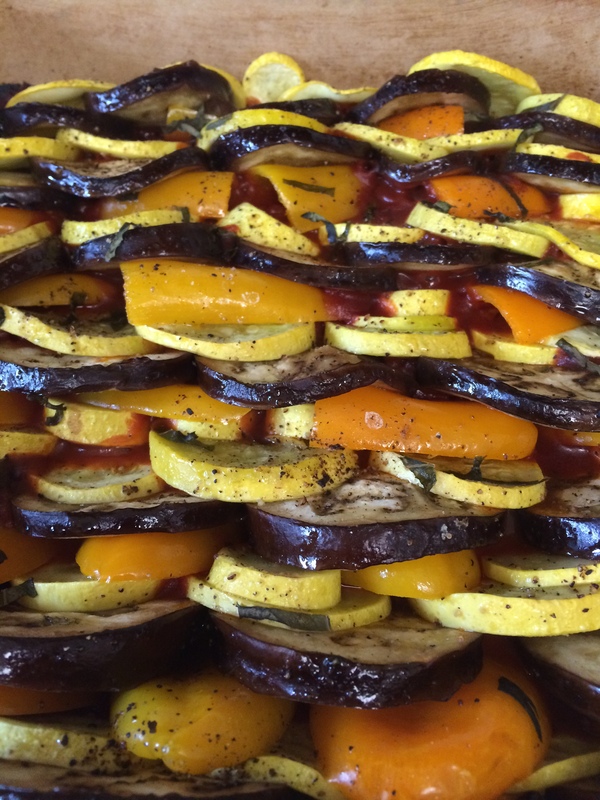 Bake uncovered at 350 degrees for 45-60 minutes. 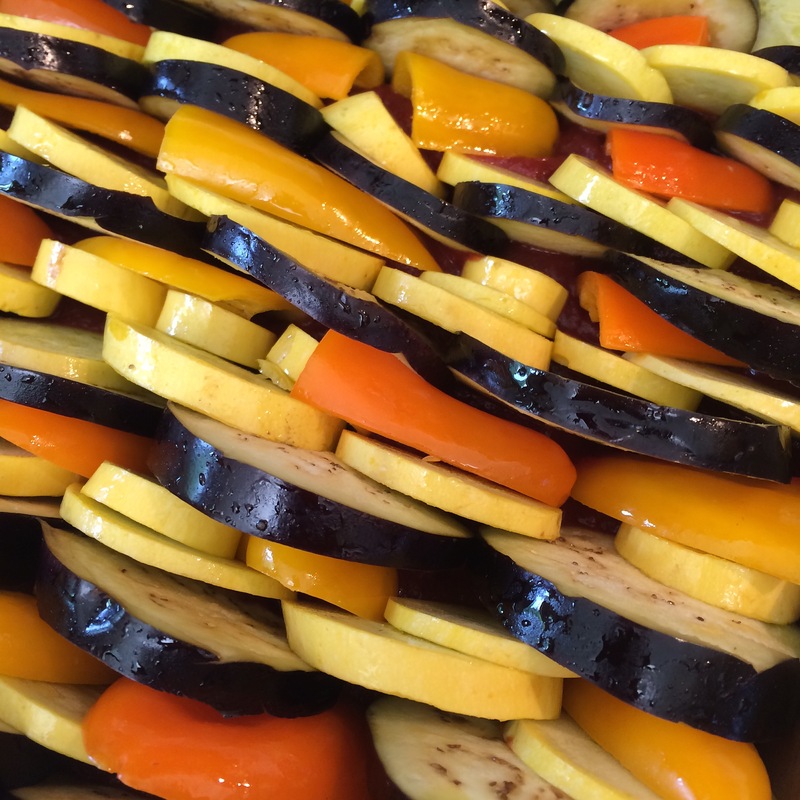 Place a foil tent lightly over the top at about 45 minutes if it starts getting too brown. Remove from heat when you see it bubbling. Let sit for 5-10 minutes. If you want to make your own sauce and your own croutons, by all means do so. Tonight I used what I had on hand. It was quick and easy. 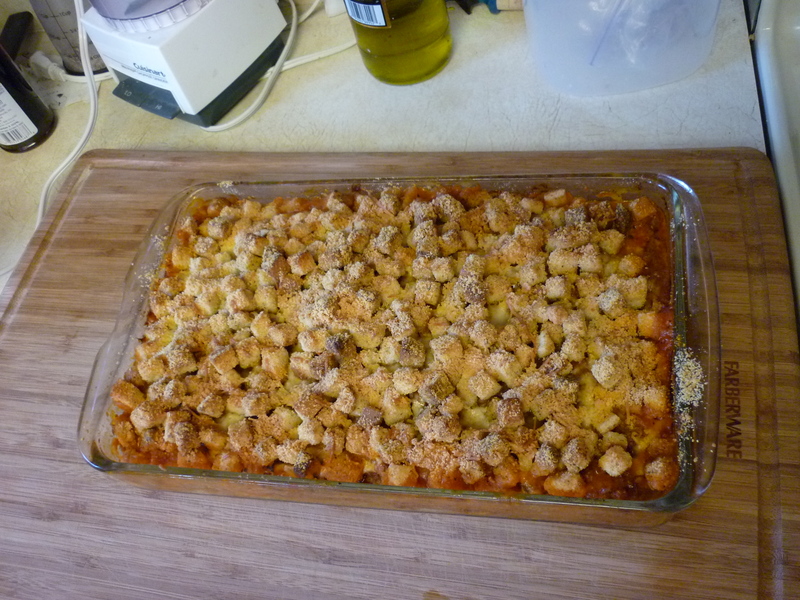 The croutons worked very well to absorb the water created by the cooking zucchini.